A Sterling Highway tem seu início na milha 37 da Seward Highway (Seward ainda e considerada a “milha 0”) e percorre 142 milhas ate a cidade de Homer, no sudoeste final da Península de Kenai. Els fornece acesso ‘as cidades de Cooper Landing, Sterling, Soldotna, Kenai, Clam Gulch, Ninilchik e Anchor Point. Depois de atravessar a Floresta Nacional de Chugach e o Refúgio Nacional de Vida Selvagem do Kenai, a estrada corre paralela ao Cook Inlet e propicia vistas de tirar o folego das montanhas de picos nevados, dos montes Mt.Illiama, Mt.Redoubt, Mt. Augustine, os quais são vulcões ativos e de uma beleza inderscritivel...O Mt.Augustine teve sua última erupção em 2006 criando nuvens de cinza que atingiram 8 milhas de altura. Campings existem em grande numero e, na alta temporada de pesca, pode ser um desafio conseguir uma vaga para acampar. A confluência dos rios Russian e Kenai e um paraíso para pesca do Red Salmon, época em que esta região fica lotada de turistas. 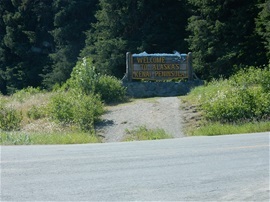 The Sterling Highway begins at mile 37 of the Seward Highway (Seward is still considered Mile 0) and travels 142 miles to Homer at the southwest end of the Kenai Peninsula. It provides access to the towns of Cooper landing, Sterling, Soldotna, Kenai, Clam Gulch, Ninilchik and Anchor Point. It was first opened in 1951 and was one of many roads surveyed by Hawley Sterling within Alaska. Some of the best fishing, camping, birding and hiking anywhere in the world can be found in the Kenai. The world record King Salmon, caught on a line, was from the Kenai River. After taking you through the Chugach National forest and the Kenai National Wildlife Refuge the highway runs parallel to cook Inlet and offers breathtaking views, across the water from snow capped Mt.Illiama, Mt.Redoubt, and Mt.Augustine. All of which are active volcanoes. Mt.Augustine last erupted in 2006 creating spectacular ash plumes that reached 8 miles high.